One of my clients has expressed frustration with the caveats I place at the end of my lighting fixture budget. Why can’t I give the client a simple budget estimate? The answer is that fixture manufacturers don’t have a manufacturer’s suggested retail price (MSRP) for their products, which is something we’ve all come to expect for products ranging from potato chips to cars. We all know that things we want to buy have an MSRP or list price and it’s up to the seller to decide whether or not to sell at a lower price. 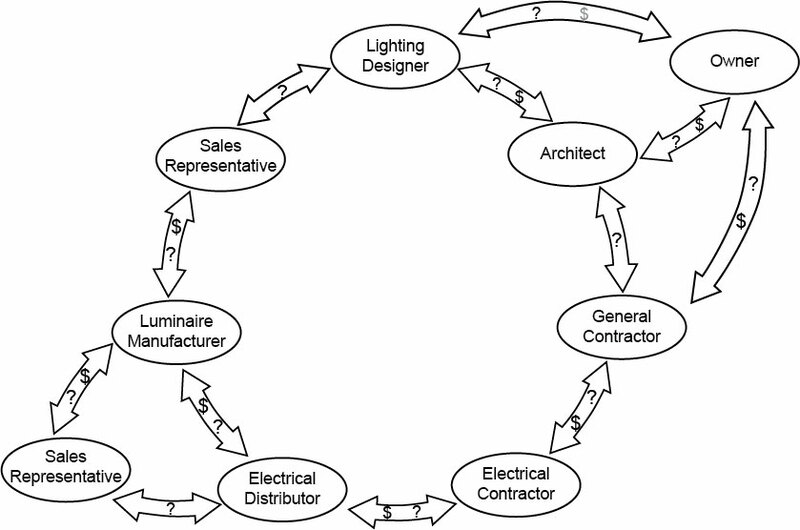 However, with lighting equipment the sales representative and the manufacturer collaborate to establish pricing for each project (see chapter 9). Larger projects with more luminaires will usually pay less per luminaire. This can be frustrating for everyone. It’s hard to develop a reliable fixture cost database when fixture costs are variable. Another issue with pricing from the sales rep is that it is usually dealer net, distributor net, or DN pricing. This means that the luminaire price the sales rep gives to the designer is the price that the electrical distributor will pay the manufacturer. It does not include the electrical distributor’s markup for overhead and profit, nor does it include possible markups by the electrical contractor and/or the general contractor. It is up to the lighting designer to estimate the total markup(s) as well as taxes, shipping and such, and add that amount to the projected lighting fixture budget, but designers have no direct knowledge of what markup these firms will add, nor do we have any control over their markups. The result is that I wind up footnoting my budget with notes like markup percentages are estimated, pricing is based on cost estimates provided by sales representative, and pricing is based on projects of similar size and scope. Finally, as I explained here, the fixtures that I specify may not be purchased for the project. Once substitutions enter the picture another layer of mystery is added. Yes, it’s complicated. Here’s a flow chart that tries to explain the flow of information (denoted by question marks) and money (denoted by dollar signs) of design and sales relationships. See chapter 9 for a full explanation.